It didn't take long for Star Wars (1977) to start spinning off fan films. Just a year after the space opera hit American cinemas, Jonathan Crow tells us, "San Francisco filmmaker Ernie Fosselius had the brainwave to make a spoof." And, as it turns out, the 13-minute film, made for $8,000, "became a pre-internet viral hit and a staple on the festival circuit, ultimately earning over $1,000,000 – an unheard of haul for a short film." It's called Hardware Wars, and you can find it in our archive. Star Wars fan films have kept coming ever since. Right through today. The latest is TIE Fighter (above). 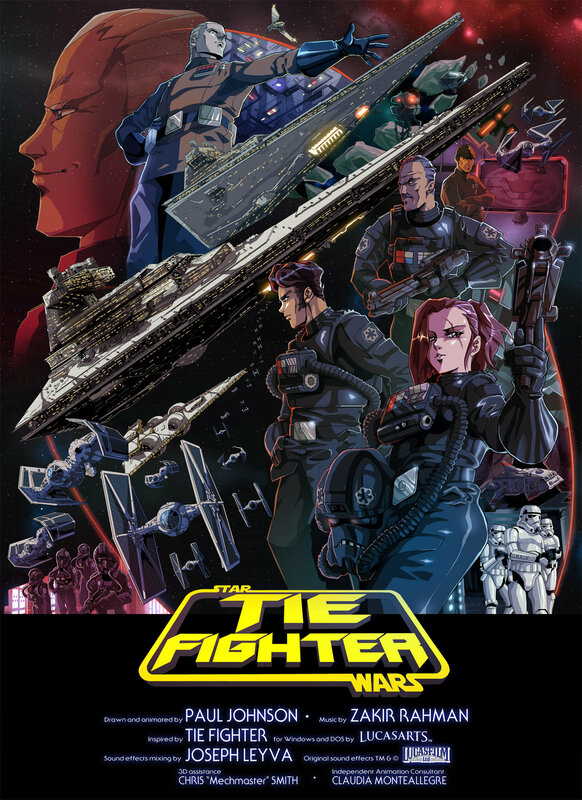 Drawn by Paul Johnson over a four-year period, the video adopts an anime style, made famous by the Japanese during the 1980s, and it tells the Star Wars story (or at least part of it), from the perspective of the Empire. A PDF of the story can be read online here. Find the official poster here. Its an honor for me to be the first to comment here.Because this fan-made anime could be the first ever,I tell you,first ever fan made anime to be ever made an official anime as I can ever imagine.Well its not 100% impossible,just saying!